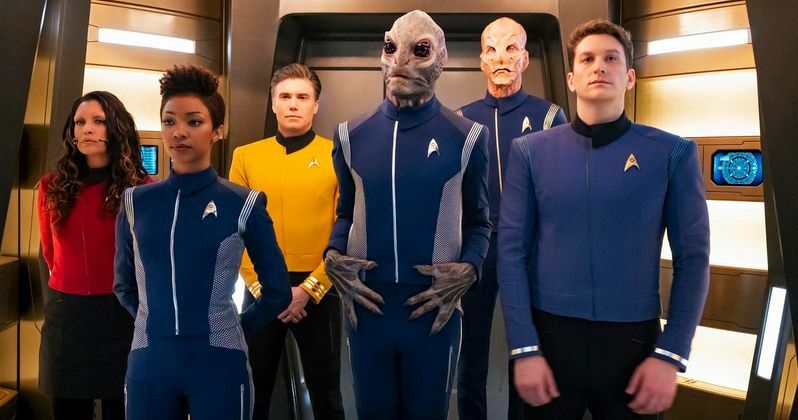 CBS had announced that it was expanding the Star Trek universe, but for now they are shrinking the cast of Star Trek Discovery less two. In this, the second season of Star Trek Discovery, we saw some HUGE cast additions. Anson Mount came on as the legendary Captain Christopher Pike of the USS Enterprise. As if that were not enough, CBS added former supermodel Rebecca Romijn to play another classic Star Trek character, Number 1, an obviously important member of Captain Pike's crew. The studio giveth, the studio taketh away. The two additions are now being axed from the lineup. Well, not exactly axed. Sources close to the series have informed us that Mount and Romijn signed one-year deals with the show. The two actors were brought in to play the classic characters of Pike and Number One, in order to sync up the second season of the Discovery series with the canon of the original Star Trek show, leading us into a new Season 3. As everyone knows who watches the show, Captain Pike was the original captain before James T. Kirk took over. Both the characters introduced again by Mount and Romijn, appeared in Gene Roddenberry's original Star Trek series, but played very fleeting roles. We did see a Pike return when Bruce Greenwood played the character in the 2009 and 2013 Star Trek movies co-written by Alex Kurtzman. Season 2 of Star Trek: Discovery has wrapped production, but the filming of the space series was not completed without some on set drama of its own. Apparently Anson Mount was involved in a physical altercation on set last year. The incident started when the actor Anson Mount was gesticulating and pointing like he was directed to do in a scene for an episode. In rehearsing the scene, Mount's hands made contact with the director. Quickly after reporting the contact to CBS HR, there was a thorough investigation by CBS. After talking to all parties involved, there was no disciplinary action taken against Anson Mount for the infraction. Even before the investigation ensued, Mount had already apologized to the director with work continuing on the episode in question until it was fully completed with no further problems. The incident itself between the actor and the director did not play into Mount's exit from the series. One source involved in the production of the show has said "we would love to find a way to work with Anson again." So there is certainly no bad blood between the actor and the show. There is no word yet on how the new series will continue the themes brought to screen by the two mythical characters of Pike and Number One. Showrunner Alex Kurtzman has said this though: "The fact that we will synchronize with canon by the end of this season, means we may see shades of where we all know Pike will end up." This news arrives via Deadline.